I am participating in Sew Many Ways Block of the Month Club and completed my second quilt block named 'Linoleum'. I am new to piecing blocks. My first quilt block 'Bow Tie can be seen here. I don't know - it just feels like I've got a lot to learn. But hey, this one finished at 12 1/4" x 12 1/4" compared to the first block finishing at 12" x 12". They are supposed to finish at 12 1/2" x 12 1/2", so maybe my third block will be the 'charm'?! Still not crazy with how the fabric designs are looking against each other. Oh well. Up next, Flying Geese.... sounds like fun. Hope all is having a good day. Oh, I really like this block! (Maybe not the name so much. ;o] ) I don't think I've ever made it. I think your work is very good. And I like the fabrics you're using. I actually thought the same about the name too! Thank you SO MUCH for your advice. 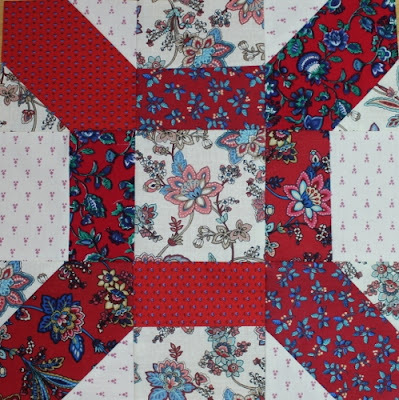 I know I can be more careful about the 1/4" seam and will be more diligent the next block and see what happens. ...and thank you for the kind compliment. It's fun to learn something new and even more fun when a kind friend helps you along. Thanks so much Mama Pea!